Rajasthan Royals, a cricket team in the Indian Premier League (IPL) — a specialized Twenty20 cricket league in India played annually, has joined hands with sportswear brand Alcis Sports. The clothing manufacturer will be the authorized multi-year kitting and merchandise partner for the IPL cricket team. 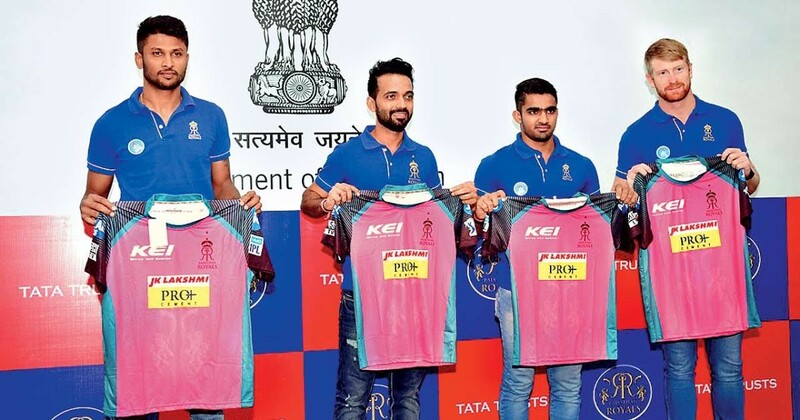 For the 2019 season, Rajasthan Royals has picked Pink as their official color. “We are really happy to be associated with Rajasthan Royals, which has consistently been one of the most exciting teams of the Indian Premier League. We will be providing kits to the Rajasthan Royals team as well as creating merchandise for its fans which will bring greater connect between the team and its fans,” Roshan Baid, Managing Director, Alcis Sports, said. The sportswear range for the team includes match jerseys, training wear, gym wear and everyday wear. The collection is chic and comfortable to wear. It comes equipped with features such as Dry-Tech — which doesn’t hold sweat and moisture for long, and are made with anti-microbial, anti-odor and anti-static finishes. The brand has also launched an exclusive at leisure line: ‘The Royals Collection by Alcis’. The range was launched by Rajasthan Royals’ brand ambassador Shane Warne, a cricketing legend who played for Australia. He also captained RR to win their maiden IPL tropy. “Alcis brings in a dash of freshness to the Rajasthan Royals brand and stands for everything that clearly defines the attributes of our brand; young, styled with innovation, inspirational and consistent,” Royals brand ambassador Shane Warne said. The new range includes match jersey inspired fan wear and at leisure, which will be a mix of playing jerseys, practice jerseys, polo’s, tees, track tops, track pants, shorts, leggings and caps. The at leisure line is now available for customers at four Alcis exclusive stores; Vaishali Nagar, Behror and Bagru in Rajasthan and Kamla Nagar in Delhi; and Shoppers Stop, Lifestyle, Central and Brand Factory. It is also up for grabs at alcissports.com, Myntra, Amazon, Flipkart, Snapdeal, Paytm, Limeroad, Tata Cliq and Gofynd.